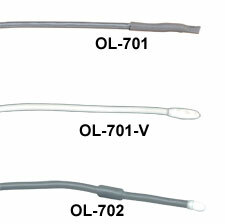 Models OL-701 and OL-701-V Include 3 meters (120") of PVC Insulated Cable with Stripped Leads. Series 700 Linear Response probe assemblies are fitted with precision 44018 linear thermistor elements rated to 100°C (212°F). Each is supplied with 3 meters (120") of PVC cable. A three (3) conductor phone plug or stripped lead termination is available. To order longer leads from the Sales Dept, place a "-length", in feet, after the model number up to 250 feet. Additional lead lengths are available at 80¢ per foot over 10 feet. See Section M for readout instrumentation. Nota: The thermistor elements in these sensors have resistances of 6000 Ohms and 30,000 Ohms at 25°C. When combined with the Optional Resistor Sets shown above, they will provide a linearised output over a defined temperature range.